A beautiful house with a unique design in the town of Mojacar. The house is located in a protected Natural area 1km from the beach. The owners, professional interior designers, did the restoration work, interior design and gardens of the house. The interiors have been designed with an elegant minimalist yet warm touch preserving the spirit of an old house. A warm Mediterranean light invades the spaces of the house, entering through the skylights that are in every room.The thick stone walls and the lush greenery of the garden keeps the house cool in the hot months of the summer. The decor consists of paintings and photographs done by the owners. The house consists of several rooms, three-bedroom suite with living room, balcony and private bathroom and a double bedroom with bathroom. It sleeps up to eight people and if necessary there is room for three children. The total area of the house is 260 square metres. The main room has an open space of 60 square metres which is the main living area with a sofa on the corner for six people and a cast iron stove. A room with a fireplace, a dining table for eight and a kitchen with a breakfast bar with two stools. This room has two outside doors one by which you can access a courtyard with benches and another door leading to a covered terrace where there is an outdoor table for eight. This space also serves as a distributor for the rooms. 'Atelier Suite' has a double bed, a living room with sofa, a kitchenette and a bathroom and access to a beautiful courtyard. 'The 'white bedroom' contains a double bed and a private bathroom, also from a glass door it has access to the patio. The other two suites have their own entrance and are interconnected. The 'Era Suite' is composed of a double bed, a living room with a sofa, kitchen, bathroom and a terrace with a table and chairs. The 'Pool Suite' consists of a double bed with bathroom, living room with sofa and fireplace, a kitchenette and a terrace with a marble table and chairs. The environment: The house cortijo de La Chumbera Blanca is located in the end of Mojacar, a small village in the Sierra de Cabrera, with white houses and narrow streets that are full of light and life in the summer nights. Macenas beaches are little known and unspoilt with pristine waters. About 20 kilometers from the house begins Cabo de Gata natural park preserved for its purity, has an area of 60 kilometers of beaches which have been maintained in its natural state without many urban modofications. Within the park there are small towns worth visiting for its tranquility and beauty. The Sierra Cabrera, which is located in Mojacar has areas of archaeological interest and there are trails practicable. The local cuisine is appreciated for its homemade dishes mainly fish. A little-known scenic spot of Mediterranean geography. Services close to the house: Mojacar Playa offers services for everyone, most frequented in summer are the bars on the beach where you can eat with your feet in the sand. On the beach you can enjoy jazz and flamenco concerts throughout the summer, with the sound of the sea in the background. The cuisine is also very varied and you can taste typical local dishes as well as any international cuisine. The nearest city is Almeria and worth a visit for its magnificent fort Arabic Nasrid period (Alcazaba). There are many interesting towns in the province that still retain their unique essence due to the lack of presence of tourism for decades. Other activities: There are many other activities, apart from beach tourism, which can be done from home. The owner of the house, a professional painter provides painting classes, in studio and in nature. We are in an area where there are marked trails and maps for walking to unexplored places. Near the house there is a bicycle rental service and quads. They offer classes on the beach diving and kite surfing all year round. Two kilometers from the house is a beautiful golf course that overlooks the sea, there are two more golf courses, 6 miles away. In winter the city of Almeria has three spa centers, two of them being replica of the ancient Arab haman. In Mojácar there is a center where you can asist yoga classes throughout the year. Coordinate flamenco classes. There is a heated swimming pool in the village, open all year round. On the same property the owner has a separate space where he will be available to answer any questions the guests may have. The bathrooms are designed with a technique widely used in North Africa, tadelak, a sort of Venetian plaster. The House was reconstructed from an old farmhouse (traditional house in Andalucia). In keeping with the traditional forms of the popular architecture of the area, houses that are cube-shaped with flat terraces, using local materials such as, stone, cane, plaster and beams on the ceilings. All this combined with a modern and minimalist décor gives the House its unique personality. We had the pleasure of staying at La Chumbera Blanca for two weeks and had a simply wonderful time. The whole experience was great from start to finish. Kika was helpful and communicative from first contact, and instinctively knows how to balance being on-hand to solve any issues and giving you the space to enjoy your holiday. She also gave us some recommendations for places around Mojacar, and yet more when we left for a few days in Almeria at the end of our holiday. The house itself is even better than the photographs. And deceptively large. The pool is lovely, the terraces perfect for sunbathing, the grounds delightful, and the house itself superbly equipped. Overall my only hesitation in recommending Kika and her house would be that too many people get to know about it! But then a place like this deserves to do well. We'll certainly be back soon! El pasado mes de octubre un grupo de doce amigos pasamos cuatro días inolvidables en la Chumbera Blanca. La casa tiene un encanto muy especial, quizá por haber sido diseñada y construida por sus dueños. Su estilo es rústico pero elegante, y todo en ella refleja la calidad y el esmero de quien levanta su propia casa con amor y cuidado. De ahí su sorprendente personalidad. Es amplia, cómoda y muy acogedora y los doce convivimos en una armonía a la que claramente contribuyó la casa. Aparte de tener unas habitaciones que en realidad son apartamentos independientes, ofrece varios espacios para estar en grupo o para perderse si alguien prefiere más soledad o independencia. Tiene un maravilloso patio interior, un amplio porche para desayunar, comer o cenar y que da al jardín, una piscina preciosa, las azoteas, una cocina muy bien equipada, grande y cómoda... Todo está cuidado al detalle y Kika e Iván están siempre disponibles para cualquier consulta o incidencia. Además tuvieron la delicadeza de dejarnos en la casa todo lo necesario para desayunar (pan, mantequilla, mermelada, leche), agua, vino, algún refresco, aceite, especias, detergente... Es decir, todo lo básico para poder cocinar y limpiar y que normalmente en ninguna casa de alquiler te dan. La Chumbera Blanca tiene la calidez de un hogar y es como un pequeño oasis dentro del entorno árido y seco de la montaña de la costa almeriense. Una delicia de contraste. La recomiendo totalmente. La casa está bien aunque la perspectiva que nos habíamos hecho tras ver las fotos era bastante mejor de lo que realmente te encuentras un situ. Más que Villa de lujo le llamaría casa rural. La piscina nada que ver la foto con la realidad y qué decir de la "cama balinesa". Una vergüenza que se ponga esa foto cuando realmente hablamos de una cama desastrosa en la azotea. Realmente nos desilusiona ver que no habéis encontrado nuestra casa a vuestro gusto tal y como es nuestro deseo siempre para con nuestros clientes. Tampoco podemos entender cómo no nos comentasteis nada durante vuestra estancia ya que nos decíais que estaba todo perfecto. Con respecto al precio, supongo que es una cuestión subjetiva pues cuando divides el precio de una semana entre nueve personas, que era el número de vuestro grupo, no pagáis más por noche y persona que por una cena cualquier noche. Cuando nosotros mostramos nuestra casa, la cual nos encanta, no deseamos confundir ni engañar a nadie sino todo lo contrario, intentamos transmitir la belleza y el cariño con el que nosotros la vemos. Yo soy fotógrafa y las fotos quedan bien pero a veces algunos clientes han comentado que las fotos no hacen justicia a la belleza de la casa y el paraje en el que se encuentra. Con respecto a la piscina, en ningún momento pretendemos confundir a nadie y por eso en todas y cada una de las fotos donde aparece la piscina ponemos las dimensiones de la misma que es 7mx3m. Supongo que se os había pasado leerlo. Me da la impresión de que estáis mirando un anuncio distinto del nuestro pues en ningún lugar mencionamos u ofrecemos una "cama balinesa", pues en principio no sé lo que es. Nosotros sí tenemos unas camas en la terraza para tomar el sol por el día y ver las estrellas por la noche y no creo que sean vergonzosas como mencionas poco generosamente en tu comentario. En definitiva nuestra casa está construida con el mimo y esmero de un proyecto personal, concebida como un lugar para disfrutar de las cosas simples de la vida, un lugar tranquilo dónde el tiempo se disfruta de otro modo y sin duda sin ninguna pretensión de ofrecer un chalet de lujo construido en serie por unos promotores. Nous y avons passé 2 semaines au mois d'août. Nous y étions en coupe +4 adolescents de 18 ans . La maison est magnifique avec ses patios et ses coins pour se reposer et s'isoler. La plage est à 10 minutes à pieds. la maison est très agréable, bien décorée, spacieuse et bien équipée. Les chambres sont spacieuses et indépendantes, la literie de bonne qualité. les salles de bain propres et agréables- La terrasse est spacieuse et très agréable aussi. le jardin est très joli, à l'abris du vent (important car la région est assez ventée) on y trouve des coins ombragés , la piscine est bien agréable! L 'accueil est très bien et si besoin, Ivan est là, il intervient rapidement! l'emplacement: on est à 5/10 minutes en voiture pour les courses et de la plage de Mojacar. Le village (en hauteur) est très joli- Les plages sont nombreuses aux alentours, il faut prendre la voiture pour y aller. Wir haben uns in dem wunderschönen Haus sehr wohl gefühlt! Leider hatten wir nur eine Woche Zeit. Jedes der unterschiedlich gestalteten Zimmer hat seinen besonderen z.T. karibischen Charme - viele Sitzmöglichkeiten, die überdachte Terrasse, früh im Mai der geschütze Patio,, der Garten, die unübertroffenen Dachterrassen mit grandiosem Ausblick. Komplette Küche, reichlich Austattung . Sehr freundlicher Empfang durch den Eigentümer , der immer erreichbar war und um die Ecke wohnt . Zum Erkunden der langen Strände, spektakulären Steilküsten und der Wüste des Capo de Gata oder auch den Strandlauf bei Sonnenaufgang ein perfekter Ausgangspunkt . Vielen Dank für den schönen Urlaub! Wir kommen wieder! 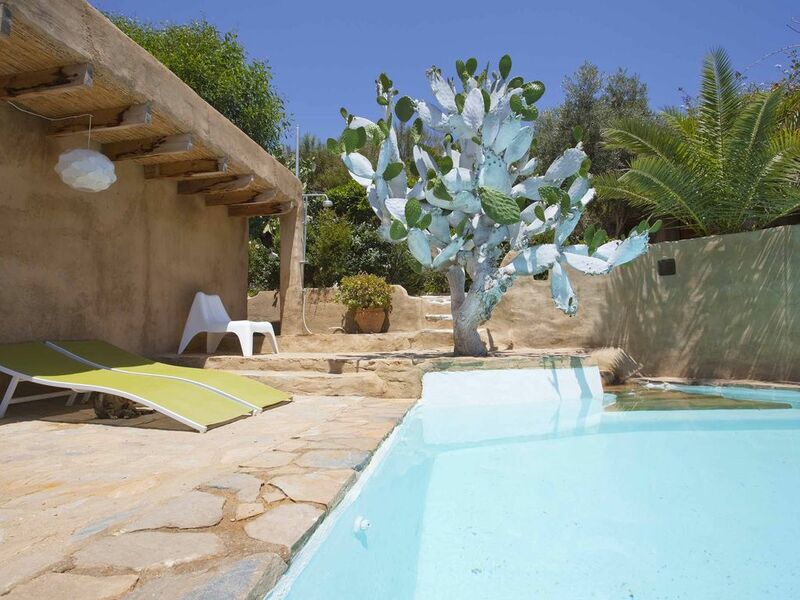 The house cortijo of Chumbera Blanca is in a superb location, just one mile from the beach and surrounded by nature. The area is quiet and surrounded by mountains where you can go hiking and enjoy the beautiful scenery. The nearest beach is the b Macenas beach, which consists of three virgin coves, is undoubtedly one of the most beautiful and best preserved espaces of the Costa de Almería. The town has maintained its traditional architecture with narrow, winding streets that hark back to its Arab past. Like every urban center has all the facilities of a modern urban space. The beach area of Mojacar offers a wide summer cultural variety, concerts, films and other activities can be enjoyed on the beach in the bars of Mojacar. Mojácar is located in the province of Almería, Levante Almeriense. The beaches of Macenas are still pristine and undeveloped. About 20 km from the cortijo is the Cabo de Gata natural park, preserved in its purity, with 60 km of unspoilt beaches. Within the park there are small towns worth visiting for their tranquility and natural beauty. There are wonderful beaches in the Natural Park of Cabo de Gata. The Los Muertos beach is one of the most beautiful in the Park, located 20 kilometres from the house. Diving in the waters of Cabo de Gata, is one of the most popular activities for visitors and you will find several schools that offer classes and daily departures. Almeria is the closest town to Mojácar. Among the many activities offered, we recommend a visit to the Alcazaba Citadel, a protected Heritage site. Golf: Just 3 kilometers from the house there is a Golf course, with astonishing views from the sea. Ski: The nearest station is in Sierra Nevada, Granada. It takes two and a half hours to get there driving in a highway, A7. La hora de entrada serán las 17.30 de la tarde y el día de salida se hará entrega de la casa a las 10.30 de la mañana. Si los clientes llegasen más tarde las 22.00 de la noche se cobrará un extra de 30 euros. Los precios son para ocho personas.